Flomaster's Seat Cover turns every drive into a relaxing massage. 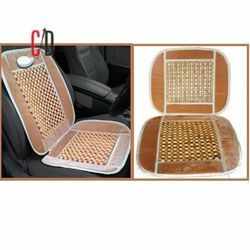 This high-quality wood beads, intricately woven at varying angles, massage your back while you drive or sit. The bead spacing and rattan perimeter ensure plenty of ventilation. It features double-strung beads that will not unravel if a thread breaks. An internal wire frame lets the cool seat conform to the seat and the mesh backing protects the upholstery. This seat cover includes elastic straps that can simply secure the seat.